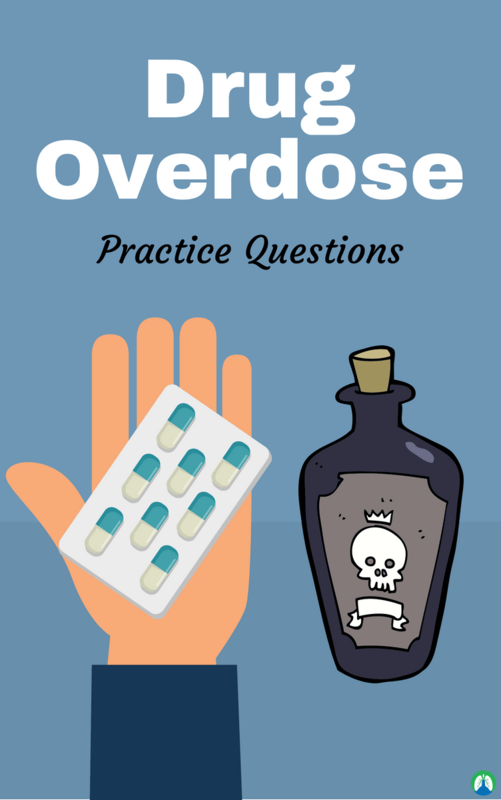 This study guide is loaded with some of the absolute best drug overdose practice questions on the web today. So if you’re a Respiratory Therapy student and that’s what you’re looking for, then you’ve definitely come to the right place. It’s important for all Respiratory Therapists to know how to properly treat patients that have had a drug overdose, especially those that work in the Emergency Department. Not to mention, you will need to know this information for the board exams as well. So let’s go ahead and dive in, shall we? 1. What is a drug overdose? An accidental or intentional use of a drug or medicine in an amount that is higher than recommended. It is the ingestion or application of a drug or substance in quantities greater than recommended that can lead to a toxic state and death. 2. What is the major pharmaceutical that causes the most overdose deaths? 3. What drug is given to someone suspected of a drug overdose? 4. When ventilation gets worse on NIV, is it better to wait another 30 mins to see if the patient gets better? No, proceed with intubation and mechanical ventilation. 5. What will be the interpretation of a drug overdose ABG? 6. What is the brand name of Naloxone? 7. What is important in figuring out the cause of an emergency? Patient’s medical history is important in figuring out what caused them to come into the ED. 8. What is not important when treating a patient? It is not important to come up with a diagnosis first. 9. Why intubate a patient who may have a drug overdose? Protect the airway and stop possible aspiration. 10. What breathe sounds that can be heard for a drug overdose? 11. What is a good RSBI score? 12. What time of day do overdose patients present to the ER? 13. What are the common routes of exposure to a drug? 14. What is the most common drug people overdose on? 15. Is death from drug overdoses continue to rise? 16. What is the description of a drug overdose with hypoventilation? Also known as respiratory depression, it is taking in a larger quantity of drugs that leads to hypoventilation causing the body to become acidotic. By definition, it causes an increased concentration of carbon dioxide (hypercapnia) and respiratory acidosis. Hypoventilation can be considered a precursor to hypoxia and its lethality is attributed to hypoxia with carbon dioxide toxicity. 17. What can cause hypoventilation when taken accidentally or intentionally? A medication or drug overdose. 18. What are the most common and particular drugs that cause respiratory depression, especially when combined with other depressants? 19. What can be a potentially life-threatening side effect in medication and recreational drugs? 20. What are some common drugs that depress the CNS causing hypoventilation leading to respiratory acidosis? Ethanol, benzodiazepines (alprazolam), barbiturates, sedatives, opioids (also called narcotics), methadone, glutethimide and ketamine. 21. What are common examples of opioids? Oxycodone, fentanyl, heroin, morphine, and codeine. 22. What are the clinical manifestations of a drug overdose? Nausea, vomiting, diarrhea, pale skin, possible cyanosis, abdominal pain, dizziness and loss of balance, seizures, drowsiness, confusion (disorientation), hypoventilation leading to hypoxia, rapid shallow respirations, decreased BP with vasodilation, signs and symptoms with hypercapnia, dyspnea (sob), headache, hyperkalemia (signs and symptoms associated with increased K+), dysrhythmias (due to increased K+), muscle weakness, hyperreflexia, hallucinations, disturbed vision, abnormal pupil dilation, impaired memory, possible coma, constipation and irritability. 23. What are the risk factors for drug overdose resulting in respiratory acidosis? Drug addicts, addiction personality, people with memory loss (mistakenly taking medications 2x or more due to forgetfulness) and elderly due to aging (toxicity- body systems slowing down). 24. What are the common antidotes for a drug overdose? Naloxone (narcan) for opioid overdose, flumazenil (romazicion) for versed and other, benzodiazepines (valium, Xanax, Ativan, restore, helicon), Vitamin K for warfarin overdose and protamine sulfate for heparin. 25. What are the diagnostics testing for drug overdose patients? ABG: ph < 7.35, PaCO2 > 45, monitor electrolytes carefully, especially K+, daily weights, I and O; and, EKG possible due to potassium levels. 26. What is the prevalence of a drug overdose? Drug-induced death now outnumbers suicide, injury by firearms, and homicide. Emergency room visits from prescription drug overdoses doubled from 2004 to 2009. Overdose deaths from painkillers have risen from less than 2,901 in 1999 to 11,499 in 2007. By 2007, more teenagers used opioid analgesics recreationally than used marijuana. 27. What are the adverse reactions of a drug overdose? Occur when individuals accidentally or intentionally misuse drugs. Misuse means self-administered without medical control for proper or sterile preparation-self prescribed. It may result in compulsive use. 28. What are examples of opiates? Heroin, Dilaudid, OxyContin, Demerol, morphine, oxycodone (Percocet), hydrocodone (Vicodin), codeine and Tylenol #3. 29. How do opiates work in the forbrain and spinal cord receptors? Bind to the site to turn off pain centers in the brain. Commonly causes euphoria. Produce drowsiness. May result in CNS depression (depress respiration) which is the reason why we are called to all OD patient rooms. 30. How do opiates work in GI receptor sites exist as well? Decreased motility of GI tract results, constipation is common. 31. What are some signs of opiate abuse? Tolerance to a substance occurs over time. Once addicted, the withdrawal will ensue restlessness, muscle and bone pain, insomnia, diarrhea, vomiting, cold flashes, anger and combative and behavior, and, paranoia. 32. What are the treatments for an opiate overdose? For recent PO ingestion, activated charcoal, and gastric lavage. Narcan: late stage PO ingestion, indicated for IV injection victims, doses high enough to reverse respiratory depression, available OC, reverse too far and the patient can seize, and O2 when necessary. Prevent detox with low doses. 33. What do stimulants counter? 34. What are benzodiazepines and what are some examples? Used as antianxiety medications and hypnotics (sleep meds). Nembutal is one example that is used for anxiety and sleep disorders. 35. What are the effects of benzodiazepines? Seizures from withdrawal are common, since brain activity is slowed down, stopping the drug will cause the brain to rebound and race out of control leading to seizures. The hypnotic/amnesiac effect which is common in accidental OD. Drug combination creates a high risk for respiratory depression, especially with alcohol, opiates, barbiturates; combining with other drugs such as cold and allergy medications, alcohol, and painkillers enhances the respiratory depression. Give O2 support. 36. What is the treatment for a benzodiazepines overdose? For recent PO ingestion, emesis when indicated, gastric lavage, activated charcoal (PO / NG /OG). For IV or late phase PO ingestion, romazicon (Please note that this is not effective). BVM when indicated. 37. What does alcohol have to do with drug overdoses? It accounts he largest amount of ED admissions for any drug on record. Greatest complications result from mixing with other drug classes. BAC: 0.05, 0.08, 0.15, and 0.20 extreme. 38. What is the treatment for alcohol abuse? Volume replacement, electrolyte replacement, prevents self-injury, monitor level of consciousness, monitor for shock, ventilatory support if needed and benzodiazepines to fight DT’s. It enhances brain activity that causes an increase in alertness, attention, and energy. Amphetamine, Ritalin, caffeine, and cocaine. 40. What are the effects of stimulants? Increased BP, increased HR, and increased respiration. 41. Why do we use stimulants? Narcolepsy, ADD/ADHD, asthma, depression and obesity. 42. What are the effects of stimulants in the body? High energy, increases blood glucose, euphoria, nausea/vomiting, convulsions/seizures, bronchodilation, paranoia, anxiety and leads to fast cardiac deterioration. 43. What are the treatments for stimulant use? Primary concerns are controlling blood pressure and prevent CVA/stroke, controlling heart rate where you may use beta blockers, loss of consciousness leading to aspiration risk and may need to be intubated, bag-mask ventilate and evaluate neurological status through head CT. Affects sight, sound and emotion. Rapid, intense emotional swings are common. Disrupts serotonin levels in the brain affecting behavior, perception of reality, body temperature, muscle control and sensory perception. 45. What are common examples of hallucinogens? Dextromethorphan (cough suppressant), PCP, Ketamine (general anesthetic), LSD- 1939, Peyote and Psilocybin. 46. What is LSD (lysergic acid diethylamide)? It is the most known potent mood and perception-altering drug. Dramatic effects on colors, smells, sounds, and other senses intensified. Produces longer term psychosis and flashbacks. No treatment and may be used as antidepressants and psychotherapy. It was developed as a surgical anesthetic, low doses result in shallow rapid breathing, high blood pressure, and heart rate. High doses can cause dangerous blood pressure and decreased awareness of pain. Muscle contractions can break bone. 48. What are the first three steps when a patient presents to ER with a suspected overdose? Assess airway. Assess breathing. Assess circulation. 49. What is the process for securing the airway? Assess airway and breathing. Give 02 if necessary. Head-tilt chin-lift, bag valve mask and may require advanced airway support in nasal trumpet and endotracheal tube (intubation). 50. What is the process for checking circulation? Monitor BP and support if necessary with IV fluids, norepinephrine if not fluid responsive and NTG or nitroprusside. 51. What is the process for checking circulation/treatment for dysrhythmias? 12 lead ECG, sodium bicarb for dysrhythmia and Mg sulfate for torsades. 52. What is screened on toxicology? Opiates, benzos, salicylates, acetaminophen, and ethanol. 53. What are the causes of an overdose? Therapeutic drug toxicity, accidental (for children), environmental exposure, occupational exposure, recreational abuse, medication error (physician error), and purposeful self-harm. 54. What is an anticholinergic overdose? Signs: blurred vision, mydriasis, decreased bowel movement, urinary retention, dry skin, fever, flushing, delirium, memory loss, and tachycardia. Substances: antihistamines, antipsychotics, and antidepressants. 55. What is a cholinergic overdose? Symptoms: bronchorrhea (watery sputum), sweating, diarrhea, vomiting, tears, miosis (pupil constriction), salivation and urination, and muscle twitch. Substances: insecticides, cholinesterase inhibitors neostigmine, and organophosphates. Thank you for much for reading this study guide and I hope that these drug overdose practice questions were helpful for you. If you don’t quite feel so confident in you knowledge of drug overdose patients, go through this guide a few more times and I guarantee that you’ll boost your knowledge (and confidence) to that next level. Thanks again and as always, breathe easy my friend.